For some reason, last night I decided that this morning we would have fresh bread and fresh butter. 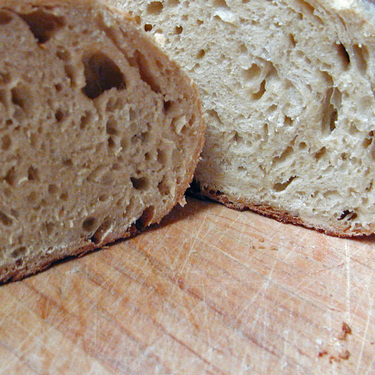 So I mixed together a batch of No-Knead Bread 2.0 from the Cook's Illustrated February 2008 issue (it differs slightly from the NYT no-knead bread by the addition of vinegar and beer, plus a minimal 15-second kneading) and put it into the water-heater closet to do its thing last night. This morning as I stumbled out of bed and got ready to go on my morning walk, I remembered that I was supposed to do something, something, what was it? Aha, the bread! I did the 15-second knead, put it to rise again into the skillet, then went on my too-cold walk. After an hour in the oven, I had the most beautiful loaf of bread I have ever made. It was smaller and denser than the normal no-knead bread, but after restraining myself for a LONG time (10 minutes) I cut into the loaf to find a nice, not-too-dense structure. 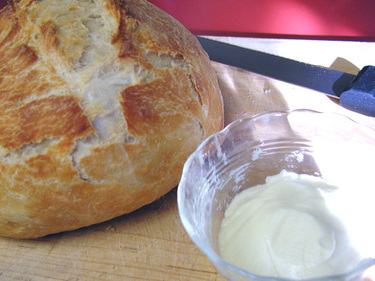 And yes, the taste of this bread is much more complex than the original no-knead recipe. "Complex" doesn't sound too descriptive. Let's just call it yummy. Our experiences this morning taught me that (1) there is a point to a butter churn, I can only assume it is easier to use than that middle stage with the jar and (2) doing things the pioneer way is an exercise program in itself, no gym membership required. Oh man, that looks so yummy! Oh that bread looks so yummy. I had heard about this recipe, but haven't tried it yet. 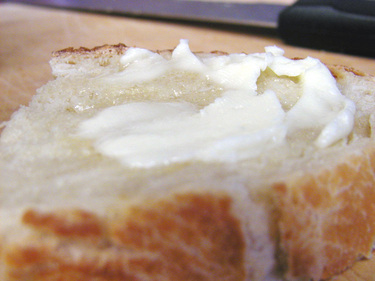 the bread and butter looks too yummy! did you add the salt to the finished product? i think you can (if i remember from 20 somewhat years ago) and it may have had a bit more flavor.